Yep, Hillary Clinton is running for the Democratic nomination to be candidate for President of the United States. I’m in New York so I had her as a first lady, then a senator, then primary candidate, then Secretary of State, and now this. For as polarizing as a public figure as Clinton may be on the national and international stage, you can turn that dial up to 11 in New York State. Maybe it’s different down in the city, but upstate where I am, she’s loved, she’s hated, she’s put up, even people that love her have hang ups with her, and oddly, even people that hate her, no, they pretty much just hate her. 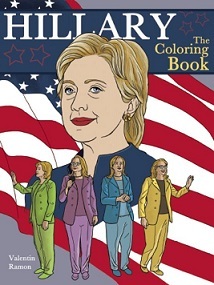 Yet all of those people can unite behind one thing, “Hillary: The Coloring Book” by Valentin Ramon and Kelly Glover. I have a limited supply of colors to draw from so my choices for skin tone were alabaster vampire or a weird orange/George Hamilton hybrid. I opted for vampire. Insert vampire politician joke here. Also, in looking at the choices I made for the jacket and blouse for what we all know is a pant suit, I realized I’m not sure I’ve ever seen Clinton in that soft of tones. We’ll call this my idealized Hillary. To be honest, my idealized Hillary is Bernie Sanders. And my idealized Bernie Sanders is Dennis Kucinich. I’m going to be one sad young lady on November 5, 2016. Where the hell was I? As early as 2002, Hillary had hinted that she might soon run for president. Speculation grew over the years and came to a head on January 20, 2007, when Hillary formed an “exploratory committee.” She made the announcement in no uncertain terms on her official website with the simple statement, “I’m in. And I’m in to win.” Her story was irresistible; Hillary was the 25th woman to run for president and the first former First Lady make a run at returning to the White House as the president herself. She received more media attention than any other candidate in the 2008 Democratic primaries, which included a host of male candidates, including Barack Obama, John Edwards, Joe Biden, Chris Dodd, Mike Gravel, Dennis Kucinich, and Bill Richardson. As the primary election went on, Hillary Clinton and Barack Obama, a young senator from Illinois, quickly became the clear front-runners, with many of the other candidates withdrawing within the first few weeks. “Hillary” is a fun, kitschy, and informative and perfectly priced at a suggested retail of $10.00. Give it to a big Hillary fan for them to have fun with. Give it to children, especially girls, as an educational gift. Give it to your favorite Hillary hater for them to deface! 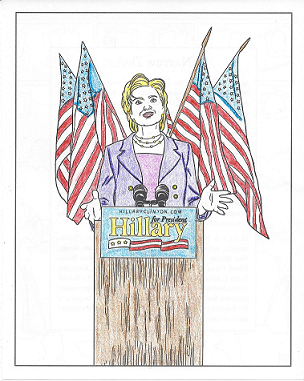 I told you at the beginning, “Hillary: The Coloring Book” is perfect for everyone!